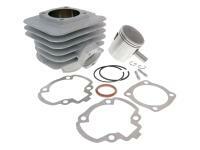 Excellent quality Airsal 105ccc aluminium cylinder kit at a cast iron cylinder price. Features a hard-chromed bore for improved heat dissipation. Provides good torque and works well with original or touring exhausts. Cylinder is supplied with a modified variator plate to best take advantage of the cylinder. Supplied without cylinder head, the original head can be used. Good improvement in performance and torque can be achieved. Supplied as shown in image. cylinder head not supplied, original head can be used as compression is designed to use with original head, carburettor will require upjetting.